Today on a livestream, Bungie showed off footage and discussed some details surrounding Destiny 2’s next DLC, Curse of Osiris, which comes out December 5. Curse of Osiris will include “new raid content” and a new area called the Infinite Forest. The Infinite Forest is actually a simulation created by the Vex. Referred to by the Bungie creative team as a “reality engine,” the device is a tool used by the gooey cyborgs to explore the past, present, and future and gain new information. In the DLC specifically, the Vex are using The Infinite Forest to search for something important while Osiris, the space wizard who was first brought up during Destiny 1, tries to stop them. The gate to the forest is station on Mercury. Players’ only contact with the planet so far has been through Osiris’ lighthouse, a small non-combat area players who successfully completed a PvP event in Destiny 1 got to explore. The Curse of Osiris DLC will finally turn it into a fully-fledged area like Destiny 2's Io or Titan. 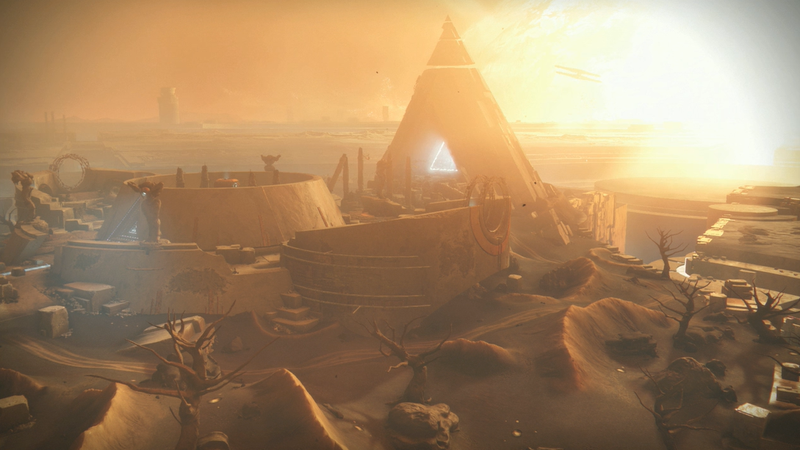 Bungie explored the planet’s beginning patrol area, which has overtones of ancient Egypt. It’s beautiful looking but mostly desert, despite Mercury having once been a heavily vegetated planet prior to the Vex takeover. The area also hosts the gate to the Infinite Forest, which is the real draw. Going through it will take players to a different version of the planet based on the mission you’re running. Enemy encounters and the environment will change across time periods. Osiris’ lighthouse looks particularly depressing in the distant future after the sun has gone out and the only things left are Vex (it’s a Vex simulation after all). In addition to the new areas shown, Bungie showed off a new kind of activity called a raid lair. It basically takes old raids and adds new, separate sections to them that can be completed on their own. Destiny 2’s Leviathan raid will have a “devourer of worlds” lair which adds new areas, encounters, puzzles as well as a brand new final boss (and obviously loot). The next expansion will add a second raid lair to the Leviathan. This is a different way of doing things compared to Destiny 1, when the first piece of DLC also added an entirely new raid. Bungie is going to release more details about the upcoming expansion in two future live streams planned for November 21 and 29.